When you have invested in a piece of original artwork, it is something you should enjoy every time you view it. When you enter the space where it hangs, it should bring you a sense of happiness and pride. Artworks can be the talking point at a dinner party if it hangs in your living area. It should be timeless, durable, and always, always make your room dance, sing, and pop. Artist Nicki Baker creates her work using a variety of in-the-moment brush strokes that feather across her working surface. Her loose, gestural work is controlled and sophisticated. The choice of colour palette and composition is evocative of her mood and purpose. ‘Carousel’ looks well-structured and delicately pleasing to the eye on the first inspection. But upon closer familiarity, you will find layers and layers of fleeting colour, an arrangement of solid shapes, and free-formed sketches that resemble a flightiness and ethereal conceptualisation. This happy and positive academic paints for the love of expression. Her self-confidence shows through her chosen mediums. 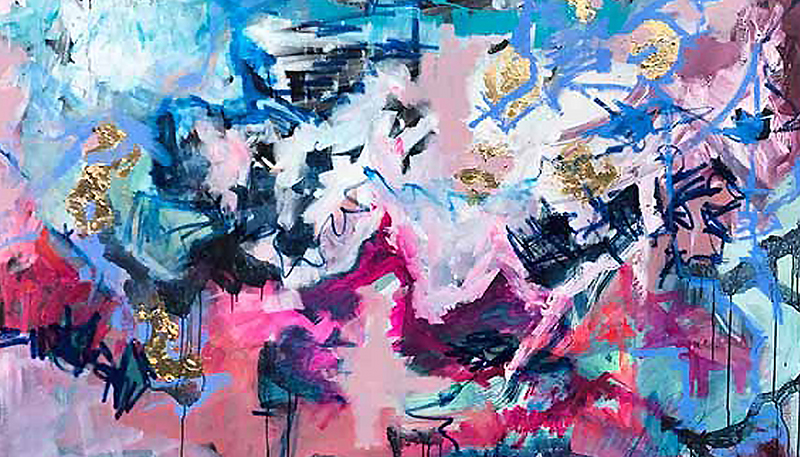 ‘Carousel’ is built up of textural layers of acrylic, gold leaf and oil stick. Solid, bold colours blend into transparent layers with ease. Smudged pastel blues, pinks, and purples are embraced with the elegance of harsh indigo, navy, and Prussian blue strokes. Gold leaf patches cover areas of the cotton canvas and break apart the drawn and painterly layers. Nicki’s brush strokes are entirely controlled. The layers are added, removed, wiped out, and re-drawn according to her vision. The colour palette is thought out before she begins the painting process. She then sets about committing it to canvas with brush, colour shaper, and knife. The artist’s objective here was to paint a purely abstract composition that will be a signature piece in any room in which it is placed. She believes a great piece of artwork should be enjoyed solely by its collector/s over and over again. But it must also speak to anyone who enters the room where it hangs. Artworks should be timeless, durable, and always, always make your room dance, sing, and pop. Creativity and self-expression are essential for everyone. When collecting a piece of artwork by artist Nicki Baker, you can be confident with the fact that you are adding your own sense of flair to a room. Dress up the room in which you display your Carousel. Add furnishings and details around the painting that speak to you. ‘Carousel’ will flatter a hallway entrance that features a simple chair and throw rug, or it would hang beautifully in a traditionally furnished or contemporary room. Allow Carousel to add elegance to a bedroom with its poetic charm or pizazz up a sitting room. This is a chameleon piece that can be worked into many interiors.